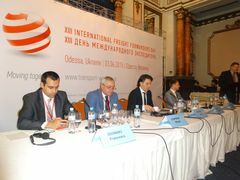 Annually the International Transport Week (ITW) convenes reputable participants: from representatives of state authorized structures, international organizations, financial institutions to direct representatives of business circles with the view of defining vectors of strategic development in the field of transport cooperation and implementation of transport-logistics projects in the Eurasian continent. The Transport Forum is becoming the main platform in the region to discuss the most urgent issues of the transport sector, the development of new information services and interactive intellectual systems in international transportation in the global market of transport-logistics services. 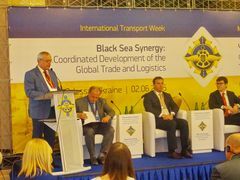 On 3-5 June 2015 during ITW in Odessa and within International Conference “International Freight Forwarders Day” Mr. Ciopraga addressed a speech. He stressed that the main aim and activity of all the countries of TRACECA region directed towards creation of attractive conditions for all participants of the transport process (transport companies, forwarding agents, carriers). Focal priorities should be based on the reasonable and efficient transport policy of all involved countries, open access to the market, in view of cargo generating potential of the countries attached to the region. Development of transport system in the region in the near future is directly related to logistics and construction of transport logistic centres. Special attention is given to modern technologies of transportation applying advanced transport-logistic schemes of freight transportation. The construction of logistic centres was launched both in the European and Asian areas of the ITC TRACECA, primarily in port zones and some nodal points. Mr. Ciopraga added that in the long-term perspective effective and integrated intermodal transport chains should promote the development of trade relationship among TRACECA countries and provide the realization of the integrated logistic chain concept. For these purposes TRACECA countries continue the realization of a detailed Master Plan prepared by “LOGMOS” Project for 7-year period. This strategic document of common technical rules and standards will be supported by a number pilot projects and in the perspective it will create a continuous logistic chain to provide effective multimodal transport along the corridor.